Remember Jerry Falwell, the Moral Majority, and the landslide election of Ronald Reagan in 1980? Now Newsmax magazine asks in its special report whether 2012 can repeat that phenomenon. And who will lead America's Christian evangelicals against Barack Obama and his liberal allies in the coming presidential election? Newsmax's cover story features the legendary evangelist Pat Robertson and the handing over of the reins at the Christian Broadcasting Network to his son Gordon. Pat and Gordon sat down with Newsmax magazine for an exclusive interview to discuss the broadcasting behemoth that now reaches 360 million viewers worldwide and how they will continue to influence the American landscape. Pat, now 81, reflects on his spiritual life, his political ambitions, and the success of the Christian Coalition. Meanwhile, his 52-year-old son is getting down to business and vows: "The best is yet to come." 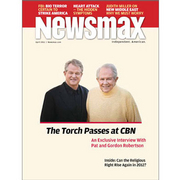 Newsmax magazine's special report, "The Torch Passes at CBN," takes an in-depth look at the network's triumphs, its many-faceted present, and its ambitious future, about which Pat is securely confident because, he tells Newsmax, "God never fails." The report also explores the evangelical vote's likely impact on the 2012 elections and details how each of the major potential candidates, such as Sarah Palin, Mike Huckabee, Mitt Romney, Donald Trump, Tim Pawlenty, and Haley Barbour, fares with Christian conservatives. Pat's Operation Blessing International — "America's best-kept secret"
Gordon's warning that the U.S. is "spending ourselves into oblivion"
FBI Warns that a WMD attack on U.S. "certain"
Bill would plug "national security loophole"